Here at Irving Rain Gutters we have a question for you? Does your house look smart and your gutters shabby? If the answer to this question is yes then we’re the team for you. 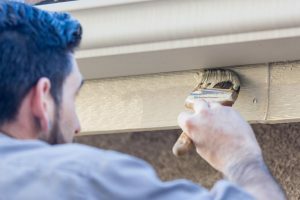 All too often you will be spending your time making the outside of your house look beautiful just to be let down by weather-stained guttering. It’s a bit like renting a posh waistcoat only to find that there is a red wine stain on your shirt. Or like cleaning your brand new car just to discover that a local pigeon has left a gift on the roof. Not a good day for anyone. Jokes aside, you know you want your house to look its best. Our team of professional painters have a lot of experience with this and we understand why it often doesn't get done. In reality, how much time do you really have to spend thinking about getting the ladder out of the garage and getting up there yourself? It’s much easier to and safer to bring in the Irving Rain Gutter team to do it for you. Problem solved. No more headaches. We are committed to getting the job done in a way that is speedy, safe, efficient and done with a smile. So, if you want to strike that annoying thing off the to do list, if you want your house looking spick and span from top to toe… it couldn't be easier to phone us and to organise a convenient date for the work to be done. We love hearing from folks in the community so even if you don’t have a job for us today, it is our pleasure to chat to you about potential jobs in the future and to get to know you better. Our team of specially trained gutter experts have no fear of heights after spending years up ladders and on scaffolding. We would rather be up there than you as we know it is a scary place to be for some of you. Rest assured, all the safety precautions will be put in place, from harnesses to hard-hats and we will try to be out of your hair in no time. Also - whilst we are up there we can have a look and then provide you with information about the state of you gutter in general. We can provide quotes for cleaning and assess any damage too. It’s a win, win situation. But it is more than just looks that we are concerned with here. A new lick of paint gives your house the lift it needs to look great but it also provides protection all year round. You don’t have to worry anymore about the elements winning the battle against your drainage system. Our team will give it the best chance of surviving the conditions for as long as possible. So - what are you waiting for? Get in contact with Irving Rain Gutters today for a chat and a free quote!